Eitan's first day of sixth form. The boys required to wear a suit and Hampton tie. 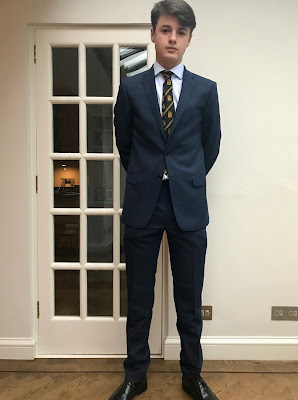 The young man is now in his final two years of preparation for University - in the UK called sixth form - where he will study four subjects for his A-levels (history, politics, geography and Spanish). He did fine on the GCSE exams (results back Aug 24) and we are proud of him - Eitan is probably more relieved than anything else. Our re-entry into the UK goes without a hitch. Madeleine and I are greeted at 45 by Sonnet with open arms and Rusty who cannot contain himself. It is nice to be home.